For the last year or so, we’ve heard all kinds of unofficial rustling about GM’s plan to unify Opel–Vauxhall with Buick globally. But there has been nothing official from GM about a formal strategy that calls for unifying the brands, at least not until CEO Dan Akerson referred to the trifecta of what have previously been “regional brands” as one “hybrid global brand”. Then in late June, GM solidified the integration of Opel-Vauxhall with Buick with the appointment of Mark Adams as the “champion for Opel/Buick brand strategies and design language”, while appointing Mr. Adams as GM Europe vice president of Design. Today, the Opel-Vauxhall and Buick brands already share certain vehicles (including the Regal/Insignia, Verano/Astra, Encore/Mokka) along with a general design theme — a circumstance that will continue to develop into the future, as rumor has it that the next-generation LaCrosse and Enclave will be common to all two three brands. It will be interesting to see how GM synchronizes the brands. In particular, we’re curious about the future of the Opel Monza Concept as a Buick, plus the transformation of the next-gen LaCrosse and Enclave into Opels. And given that Buick is already a “premium” brand (although not full-on luxury like Cadillac), merging it with Opel and subsequently moving the latter upmarket will allow Chevrolet to make it in Europe as the “value” brand. Therefore, unifying the trio seems like a smart move at this point. Opel sells where? Germany only? Vauxhall sells where? England only? Is Vauxhall already a premium brand like Buick in the US and therefore does not need to move upmarket? If those two brands are premium in the markets that they sell in, then that leaves room to bring in Chevrolet who is non-existent in Europe at this point? Where does that put the Opel/Vauxhall Adam at? It fits into the subcompact or microcar market? Of course the same can be said for bringing the Adam to Buick in America. I guess if they do bring it here, it would create a new class in America of PREMIUM subcompact/microcar? The Euro market is a bit different than NA in that cars tend to be more expensive. In addition, ‘premium’ brands are more often than not seen as mainstream. As an example, VW is considered both premium and mainstream in Europe while Skoda is seen as a value brand. At this point, Opels are on par with VW in terms of quality according to reviews but has an all over the place price structure. Untill about 2007, Opel was more of a value brand but now hovers just below VW which confuses buyers. Also perplexing is that a fully loaded Insignia actually costs slightly more than a low trim Audi. Right now GM wants to raise prices but dealers lack faith and would rather battle Skoda–such a more for less plan would bring about victory in a snap. GM wants Chevy to fill that void. Interesting fact….Chevy and Ford are not equals in Europe. Ford battles Opel, not Chevy. Many automakers transform image depending on market. VW is basically value like Chevy or Ford in the US but spars with Buick in China. Firstly, Opel is marketed right across Western and Eastern Europe (excluding the UK), certain markets in the Middle East and Asia, Southern Africa and Australia. It is not German only. Secondly, Vauxhall is marketed across all four countries in the United Kingdom, not just England. The UK is GM’s third largest global market, behind China and the USA. In the UK Vauxhall is No.2 to Ford. Vauxhall has a far more extensive model range than Buick, extending from the city-car segment (Agila – 75BHP) right up to large premium (the mighty VXR8 GTS – 574 BHP). The latter is a re-badged Holden Commodore imported from Australia and is available as a saloon, station-wagon and pick-up! The VXR8 is not marketed as an Opel. 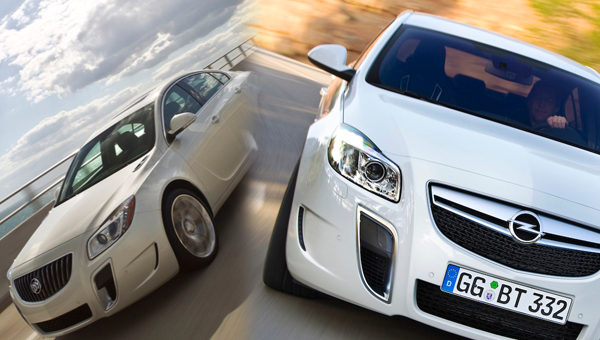 As a single model example, take the Vauxhall Insignia which is available as a saloon, hatch-back and station-wagon. There are no less than 232 officially listed variants in a bewildering array of trim levels, (including manual, auto, petrol, diesel, 4-pot, V6, turbo, 4×4, etc.). Prices range from £18,860 (1.4T ES hatch-back) to £36,760 (2.8T VXR 4×4 Auto station-wagon). And remember, this is before you start adding personal options. Is it any wonder that the Insignia is the biggest seller in its segment. As a range of cars, Vauxhall pricing stretches from £8,495 (1.0ltr 3 cylinder Agila) to the £55,000+ (VXR8 GTS – super-charged LS3), covering everything form eco-basic to premium luxury-sports. The Agila city-car is practical and value led, whilst the similarly sized Adam is aimed at the young and style-conscious … think Mini and Fiat 500. Daewoo first entered the UK market around 20 years ago, always selling re-badged, re-styled previous generation Opel/Vauxhalls with some success. Then around 8 years ago GM decided that in Europe they would swap-out Daewoo for Chevrolet. Overnight a bow-tie was slapped on each end of every Daewoo and it took several years before specific Chevrolet designed and developed models began to trickle through. Europeans saw this for what it was and ever since Chevy has since struggled to attain the moderate success of Daewoo. Moreover, us Europeans associate the Chevy brand with Corvettes, Camaros, Impalas and Silverados and certainly not Spark or Aveo! • In 2012 there were 535.711 new car registrations of GM brands in Brasil in the category of “light vehicles”, putting GM in third place after Fiat and VW. To this one can add 106.933 units of “light commercials” (I don’t know where the Brasilian statisticians draw the line between the two). • In 2012 there were 245’731 new car registrations by all three GM brands in the country UKoGBaNI, which is less than half of those in Brasil. Hard to uphold the claim of the country UKoGBaNI being the third largest market of GM. This figures for UK are slightly higher then those for Germany with 243’528. While Germany is by far the largest car market in Europe (Russian Federation might take over that space) with 3 mln, Opel there has only fifth place after VW, BMW, Mercedes and Audi, while Vauxhall is second in the UKoGBaNI after Ford. This is simply not true. Daewoo has developed and manufactured their own cars. There is no relationship whatsoever between an Opel/Vauxhall Astra and an Daewoo Lacetti/Nubira, etc etc. It is only with the Cruze, the Aveo/Sonic, the Spark, that Daewoo (now GM Korea) has producing global GM vehicles based on common GM platforms. The UK used to be GM’s second biggest market before China boomed so one would guess its third now. Vauxhall sell each year nearly 250,000 cars in the UK – one of Europe’s biggest if not biggest markets. Daewoo used to sell MK2 Astra’s & Mk2 Cavalier’s under their own names (sorry forgot them) by which time they was a decade and a half old we was on MK3/4 Astra & Vectra/s by this time. They weren’t bad cars just old hence they designed their own (non Vauxhall / Opel) cars that wasn’t as good (Daewoo’s were sold via a car spares shop, not showrooms) in a effort to expand the range Ssangyong 4×4’s were rebadged & a new car called Matiz launched. Sales still hovered around 11,000 yearly so it was decided the 4×4’s would be axed, after still no improvement in sales Chevrolet took over. You don’t want to face the facts … The UK might have been GM’s second market IN EUROPE. But still in 2011, Opel sold 268,357 cars in Germany, 268,275 in the country UKoGBaNI, a difference of 82 units…(only Opel/Vauxhall; figures from the Opel annual report). For the first time, the UKoGBaNI sales bypassed those in Germany in 2012. In 2000, the difference was much more marked: 421,500 units of all GM brands in Germany, 313,200 in the UKoGBaNI (figures from “GM Europe Facts and Figures 2000”). Sure, both in 2000 and in 2011 and 2012, the market share was higher in the UKoGBaNI than in Germany, but the total numbers were higher in Germany. In 2000, GM (or Opel) was second as to market share in Germany, but lost that position in subsequent years to BMW, Mercedes and Audi. History never stops. I do not have access to long data series on the automobile market in Brasil, but I am quite sure that it is not due to the China’s economic development that the Brasil sales figures are more than double those of UKoGBaNI. And again, I still hold that your perceptions about the origina of Daewoo cars is utterly wrong. Please stick to the facts, not fantasies. One more fact: the UK market is the only major automobile market in Western Europe to actually growing during these years of economic crisis. As said, the automobile market in the UKoGBaNI is the only (major) market in Europe which shows some growth, while all others are shrinking. This does not say anything about this or that brand profiting or suffering from this development. Vauxhall seems healthy. Maybe Opel needs to look at what the brand is doing right in terms of promo, dealers and options. Maybe they should simply rebrand Opel as Vauxhall? I say this half kidding but think Vaux should be used in Anglosphere: India, AU, Nz and Ireland. THANK YOU for your help! I have a better understanding of the European market at this point. I’ll admit, a geography lesson was needed as well. I’m not sure where Chevrolet fits in the Vauxhall market as they sell across such a broad range. Visiting the Vauxhall website was an eye opener! In addition, with GM’s history of selling Chevys as rebadged Daewoos, they have a long road ahead of them to change brand perception. It sounds like Hyundai & Kia are trying to do something similar to Vauxhall here in the states by marketing a more extensive range of products. Daewoo had its own designs pre the Asian financial crisis. The were not selling old Opels. UK market lags Brazil and is not number two. Clearly Vauxhall is the UK brand. GM would be silly to have an England only marque. Daewoo had its own designs pre the Asian financial crisis. They were not selling old Opels. Hi, Opel Cars are sold in Europe with the exception of UK where they are sold under the Vauxhall brand. Opel has close to 7% marketshare versus Chevrolet’s 1%. GM continuously tries to move Opel/ Vauxhall upmarket which leaves a niche for Chevrolet to play the value game. This plan is turbine out to be more challenging due to improved quality of Brands’ zich as Kia,Hyundai, Skoda and Seat which have improved their quality and design substantially, helpen by massieve group resources. As to the Adam, it could be an option for Buick but some more work is needed on the engine front. to find out where Opel sells, you may call the opel.com worldwide website and follow the “Choose your country” link in the upper right corner of the main image — if you have “Shockwave Flash” installed and activated. Otherwise the “Choose your country” will be in the lower left of the screen, and the choice of countries offered will be limited to Europe and its fringes. GM has a long history of making dumb decisions with respect to it’s international operations. While other auto makers have world wide brands, GM has regional ones. Once upon a time you could buy Chevs, Buicks and Plymouths in Australia and NZ but now they will be served with Opels made in Germany. How stupid is that? Hopefully this will benefit Opel Australia. The brand is trying to market itself here as VW and Renault but is failing to gain a market share because at the moment it is still seen as being like Holden, particularly because the Astra was sold as a Holden Astra previously. The Opel Astra has been priced too high imo. Opel really needs the level of luxury to increase or it will fade away here. The Aussie market is too crowded for them. Opel AU was doomed from the start due to Astra links to Holden. Maybe GM should have positioned Opel as a Holden sub brand like Scion or even defunt GEO. This was an expensive experiment gone wrong. I would almost think Vauxhall would be better in an English speaking nation. Buick would have been interesting due to AU links with China. A pity such great cars failed. Wile 85% of the models will be shared I am not sure they all will be. The Enclave is too large for most in Europe and would either have to shrink or be sold in small imported numbers. I expect GM will tailor each model to the market but some will just not translate well for the number of sales they would see. This deal will give GM options and leverage on what they can do in each market and spread the cost to help make them more profitable. Now on the other hand we may see Buicks here we would never have seen before like the Adam etc. It will be interesting to see the new products just how they are shared. Holden right now is a good example of what we will see. Right now they are mostly Chevy but they do have a few models shared in market and shared back to Chevy. Then they have the Trailblazer for their market and Chevy has the Traverse. Also note the differences in the new Colorado as it will take a more Full Size styling here in the nose while down under they see the global nose. I am glad GM is going global but will still take the time to make the models more specific to each market. They could have just taken the easy way out. While the Enclave is large, the size of an Audi Q7, it is far from the wobbly barges US cars of yesterday used to be, the laughing stock of Europe, if not the whole world. It seems to have a good space economy, not such a waste of space of those past cars. There are a number of well selling cars of the size of a Lacrosse; the European 2010 Saab 9-5 was built on the same platform variant, and it had the same size (overall length). The problem is only that today the image of Opel is so, that most people do not expect such a car coming out of Rüsselsheim. I believe that the new management team wants to change that. They might succeed. Opel-Vauxhall-Buick are the new Tri-Shield replacing Invicta, LaSabre and Electra and I would love to see a updated tri-shield slapped in all three brands with elements that represent each marque–color, coat of arms and so on. I also want to see models standardizes as is the case already with Opel and Vauxhall. Insignia by Opel; Insignia by Buick; Insignia by Vauxhall–this should be how autos are promoted. Non-global cars set for Europe only should be outsourced to PSA much like Toyota has Mazda developing next gen Yaris. This increases scale for such models, resuces R&D, and these vehicles could benefit from the ethos of those who do so well with DS. With this said, these models are often the bread and butter of GM Europe sales so the partnership must receive special attention. Such moves will aid Chevy in Europe by avoiding badge engineering. This relationship will help PSA too via technology transfer. Scott, I beg to differ. The Enclave’s rivals X5,Q7,ML, Toureg, XC90 etc was all built with the US market in mind, yet sell sufficiently in Europe too so why not get more additional European sales out of Enclave? Yes they sell in Europe and they are seen as the home team. Even Opel selling a American based vehicle would not eve come close to those numbers at least with the present vehicle. You would sell a few hundred and never make back the cost involved changing them for Europe. A new Enclave developed with both markets in mind would be better to wait for and better to invest in. As of now we all need to forget the cars Buick has as being used as Opel’s as most will be replaced in the near future if they are not Opel’s already. The lacrosse just got a refresh and is do for replacement in the not to distant future. Also the Enclave just received a refresh. The Verano platform is being replace next year in the Cruze and the Buick should not be too far behind. Look for new cars on the new platforms designed and built to be Buicks and Opel’s to fill out the line ups here and not so much more Opel’s converted to be Buicks and Buick converted to be Opel’s. The only reason we have had that is Buick just had nothing coming and they had to use what they had available. Most of Buicks money went to the SUV’s as they were making the money. The Opel’s did a good job but their time has come to be replaced and these will be truly joint developed global cars. We have to remember the Lacrosse is old and the Regal is not new for Opel. Refresh are good for about 2 years and then we replace them. The new Coupe Opel showed was a Buick/Opel from the start and is just the first of more cars we will see developed with both markets in mind. I almost think the Lacrosse will be replaced with a RWD/AWD Alpha and a TT V6. This also will be shared with the coupe. This will give the Regal room to grow a little giving the Verano room. The Regal would make a nice FWD/AWD package and keep the Turbo 4. If GM is going to do this they need to make a big impression and not just rehash cars from here that were designed 10 years ago. You give them new stuff and make it up to date and stunning. Also you design it with their market in mind. America is more open minded to imports vs. many places in Europe. Either way the jointly developed vehicles will benefit both division much and really help Opel move up and give Buick even better product here. As for China it will just increase appeal and sales. Now read this and understand this as from here on out we have to stop thinking the Opleization of Buick or the Buickization of Opel. This is one unit working for the joint vehicles for three global markets they represent and the smaller ones they end up in. This is not three market and no longer two division. To be honest I am excited as this is more than just converting a Lacrosse and hoping Fritz and Hans like it. We are seeing a rebirth of two great name plates. Thank you for the clear and concise comments. I appreciate and agree with what you stated. I see things as they are. It lines up with what I said. I will try to stop referring to it as the Opelization of Buick. I do understand these are global vehicles for three brands and have to appeal to three different markets. I do hope this will help Buick and Opel change their images and perception and grow and change and have a renewed perception. I do wish the best to these brands. I am a fan of Vauxhall. The other thing is, I am not a Buick person. I have fond memories of some past Buicks, but I do want to see Buick succeed too. The problem with the Enclave is that it is offered with a single type of engine only. That is poor. It mainly needs a good Diesel engine. Mind you, all those big SUVs are sold nearly exclusively with Diesel engines – Audi Q7: 99% (all figures for Jan-Jun 2013 in Germany); BMW X5: 97.8%; VW Touareg: 98.4%. Even the Chevrolet Captiva: 89.5% — well the Captiva is a smaller SUV, so the Diesel share is lower. Again the Enclave as you know it today has little chance of becoming an Opel. Crash standard, tuning and customer expectations were never designed into the present model. The next gen will see these changes not the present old platform that is nearing the end of its life. Now the new Enclave can be designed to fit the needs of both markets and even RHD for a possible Vauxhall. Like I said none of todays Buicks will make the trip out side the Encore. New product is where this process will begin. you may well be right. I have never seen a Buick Enclave “in the wild”, only its cousin, the Chevrolet Traverse . The successor of the Enclave then might be developed in Rüsselsheim,. Time wil tell. Never see an Enclave? I can’t fling a dead cat here and not hit one. Keep in mind there is no Detroit or Russelsheim, the new products will be a joint development buy all of GM giving help and input not just one part of the GM. I will visit the Rüsselsheim Opel factory on Tuesday on a plant tour organized by the local newspaper. This will give you a glimpse of my whereabouts. The dealers of exotic cars who distribute the few US models here concentrate on the real exotic stuff like pickups and muscle cars. You know you could have just said Europe. Then it would make sense. Well, GM has obviously assembled the leading team of the common effort in Rüsselsheim, with K.E. Neumann as boss of GM Europe and of Opel, and member of GM’s Executive Committee; Mark Adams as design director for Opel/Vauxhall and Buick China and Buick NA (M.A. was already responsible for the design of the Monza Concept); Tina Müller as the marketing director for that “hybrid international brand”. Let’s also keep in mind what Mr. Akerson said of this “hybrid international brand”, namely that to manage this might be “the most complicated Rubic’s Cube”. Vauxhall is marketed as “very British”, so only in the UKoGBaNI, Opel worldwide as “German engineering”, Buick in North America as “luxury brand”, and in China as the brand which supplied the car to the last emperor, who had to step aside for China to become a republic and adopt democracy and finally in 1949 really independent. Wont be easy to mange this. Not hard to manage as GM has already been doing this on the Cruze, Camaro and SS already. True there will be a lead team some where but the project is done globally and will be a 24 hour program. Electronics today have made this possible to do anymore. Of late Buicks were based on Opel foundations with Buicks tuning and Chinese styling. This will not change much but will we started from the beginning and not from a already established Opel converted into a Buick. Don’t kid yourself on Vauxhall too much as they are not as British as you would like to think. Yes they tune the suspensions and move the wheel to the wrong side but for the most you have a big slice of Opel in the FWD and Holden in the RWD. It is a good car and if they are fooling the British that much then fine. Either way the cars will be done in at least three locations and inputted to the main team. I would not be shocked if Opel is the main hub as that is the greatest value of Opel is their design team for suspensions and platforms. I actually think the Opel-Vauxhall-Buick brand will be easy in terms of product. ALL cars come off as European these days…FORD is maybe the best example. GM will fine tune each car in terms of region, and we can expect larger models to do better in NA and China and the smaller city cars will thrive in Europe. Every brand does global design now. Consumers have ajusted aa one can see from Focus, Cruze and Jetta. In terms of products, yes. But GM does obviously try to project four different brand images with one and the same product, as I laid out above. This is absolutely not the same as Chevrolet which has the same name globally. I’ll withdraw now from this thread. Scott, I rated your comments a thumbs-up, but a little more clarity is needed around Vauxhall. Brits travel often enough to the European main-land to know that Opel and Vauxhall are one and the same and that the cars are essentially German. Vice-versa with those traveling to the UK. What’s also interesting is the number of Europeans (especially on the youth tuning-scene) who Vauxhallize their Opels as a point of differentiation. Of the three big players in the UK (of which Vauxhall is and has been No.2 for the last 2 decades), year to date VW is up 6%, market-leader Ford up 9% and Vauxhall up 14%. In contrast, the UK market is up 10% ytd. Brits appreciate good product coupled to VFM and it shows. The Astra station-wagon (estate or sports-tourer, depending on market) was designed and engineered wholly in Milbrook England. It is built solely at the Ellesmere Port plant in the UK and exported across Europe badged as an Opel. The same goes for the Astra van. It is worth noting too, that Ellesmere Port has been selected as the global lead plant for the next generation Astra, with significant design and development input from Milbrook. Previous generations of Astra, Vectra and Cavalier/Ascona were similarly exported as Opels across Europe. Vauxhall’s Luton and Ellesmere Port plants also exported pre-gen models to Australia and New Zealand, in RHD guise, badged as Holden. Then there is the Vivaro/Trafic van, of which Luton alone has built more than 900,000. This is a joint venture with Renault, both parties sharing the engineering and development 50:50. Milbrook (Vauxhall) and Sandouville (Renault) are currently working on the 2014 replacement. Luton solely produces the Vivaro in LHD and RHD for all GM markets, including South Africa. Luton also produces Renault and Nissan RHD variants of this model. – the Opel/Vauxhall Combo is a JV with Fiat and is built solely in Turkey. – the Opel/Vauxhall Movano is another JV with Renault and is built solely in France. – the Opel/Vauxhall Corsa van is built only in Zaragoza, Spain. The Corsa is also the only LCV to be built in any Opel designated plant. I know many are not fooled but some are. We get the same here where some think there is a big difference in the Chevy Equinox vs. the GMC Terrain when only the body shape and dash lights are the main changes other than some minor trim. Same with Pontiac and Chevy in the late years where in truth they were closer than many will like to admit. The real key to Vauxhall is the name as it holds some national connection to the UK and I am sure it is responsible for more sales than if it were just branded an Opel. Also the RHD is a must in the market. GM is learning fast that if they want to compete in the UK they will have to move the wheel. But that is ok as it will open more vehicles to Australia too. Cars like the Camaro in the sixth gen will have the ability to go RHD and I suspect the sending of the 5th gen even in limited numbers in LHD will set the ground work for the new LHD model when it arrives. As for people changing badging we have it here too with the Pontiac GTO wearing Holden grills and badges. We have a few right here in my area. I am sure there is still work done in the UK as GM maintains staff there. In fact they have been behind a lot of styling there more than anything as the Kappa had a lot of work done there as well as some GM LAB work on a Buick concept. But the key think we need to keep in mind is this is not Vauxhall doing the work or Opel doing the work or even Buick. It is all of them as they are not separate anymore and will work as a global team. The same was done on the Camaro when it came back as Chevy and Holden did the work here and down under. It was not a Chevy or Holden deal it was a joint deal and assembled in Canada. In the past the GM global was all separate and a lot of duplication in many cases. Many divisions taking the same platform and doing the same work with only some changes. Today these groups are working as one and will see that the product fits the needs of each market it will be in. No matter how you see it platforms will be developed cheaper, faster and will take advantage of the best of GM globally vs. just what was in their office and what they were given to start with. The bottom line is we will get much better cars in all markets. It will be interesting to see how the “Opelize” LaCrosse and Enclave also. You notice this is a globalization thing and you notice it is not Opels becoming Buicks, but Buicks becoming Opels. They are making them more “Euro”. This does two things: It positions Buick away from Cadillac in the United States as Buick will not have large cars or American looking cars. It positions Buick below Cadillac in North America as a “premium brand” not a “luxury brand” This also positions Opel and Vauxhall to move up in Europe with the right product and marketing to become Buick Europe. This also positions GM to make better use of economies of scale globally. My issue is what are they going to do in China? Buick and Opel are both sold in China. This also means these designs globally must appeal to three groups: The Chinese, The Americans and The Europeans. The Opelization of Buick continues…..
Opel will never be a real player in China. I feel like GM wants to flood the market with marques. Opel would make for a great small car brand in both China and NA with the former Saab 9-5 as a halo range topper. I don’t see Buick China going totally Euro. I see the development of a global design style which may be why GM called the effort difficult and brought back Adams. I don’t think Opel looks very Euro anyway–no more than Ford. I wanna see GM kill Opel and Buick and just call the brand Vauxhall. It has a nice ring and lacks the neg images linked to the other marques. Wonder if they have plans for a European LaCrosse? It would fit in between Insignia and VXR8 and could be named Omega. I have seen images on the Internet of a Opelized LaCrosse. There is also images of a XTS as Opel, could one or both be desting for Europe. The “European LaCrosse” was the stillborn 2010 Saab 9-5. If the enclave goes to Opel, what will it be named as? Enclava lol? The key is that GM will fundamentally change Buick and Opel in many ways. Buick/Opel will have to fill the void between the higher end VW to the low end Audi class. This means they will have to have handling, styling, Luxury and power to meet up with the members in this slice of the market. They will also have to seek new buyers and sell products that will make some one in Europe willing to pay more for an Opel than they ever have before. They also need Buick to appeal to people younger than before while still retaining some of the old crowd. We will lose some buyers but we could and need to gain more back in these other segments that do not pay attention to these brands now. The key is new product that really stands out and makes you say wow. It has to be top notch in all areas of this segment. No more just as good applies here it has to be better. In other words we need a car that would make someone like Jeremy Clarkson say I hate to admit it but I love this car. The ZR1 got him to say that about the car built by fat men in Kentucky so GM can do it but they need to get it right. Todays product are just props to hold up the present show room and it is the coming product that will move this shell game to the next level. It will take investment and it will take time. Do not expect GM to dominate Europe in the next 10 years but we do need to see steady growth. I think the biggest challenge will be Opel as they have a tough segment to fight in where as Buick I think can reinvent themselves more easily if they can get the few remaining loyal people to be more open minded and let Buick become what they need to be and not what they have been. Buick has improved but they are no where near where they need to end up. Todays product is the path no the destination. Very well said. You seem to know a lot about GM products. I am in agreement it will take time. Opel has the hardest road, but it will get there. Buick will change like Cadillac did over time. Perception has to catch up to reality eventually. It takes time to undo damage that has been done. You cannot undo damage over night. It did not get into this situation overnight. I do admit by consolidating globally Buick, Opel and Vauxhall it makes sense. You leverage what you have to be a better player globally. I want to see Regal get a fair chance as right now it is being cannibalized on both ends. Now, I will tell you I am an Oldsmobile person. I own two Oldsmobiles( 1995 98 and a 1992 Oldsmobile Toronado). I plan on keeping my cars because GM killed my brand and GM offers nothing for me anymore. I am not buying Chevrolets period and I am not driving Cadillacs because they have come up fast and the image is very prestigious or at least is headed that way.. I am not a Buick person and the new Buick as you stated it is changing does not appeal to me. I am sure it will appeal to people who have not considered Buick in the past and gain a younger audience. That is a good thing. I tell you this because of what you said about losing Buick buyers and hoping to gain new ones and hope some will change their perception. I wanted to support GM and buy a new GM, but they have nothing for me or a brand for me. I have enjoyed your detail posts and explaining how things will change and the direction GM is aiming for. Your are profoundly anti-union. GM and Ford are producing great cars while offering union workers fair pay for steller work. Meanwhile, companies like Kia are taking advantage of the depressed economies of southern states while not investing in the local economies. I would love to see the US Gov tax non union automakers the difference, what scabs call savings. Ford has amazing margins while respecting labor. GM has cut Euro costs without harming German and British workers at remaining plants. I want to see income increase, not decrease, and this becomes even more important whwn savings are not passes onto buyers as in the case of VW, Benz and BMW. I am neither pro or anti union. All I have stated is what is going on in the automotive area. There are many times that unions are good but there are also areas where unions are a negative. The best situations are the places where companies and unions have learned to work together. The reality is the more competitive and profitable a company is the better ever one is. Lordstown has been a great example of this. It is GM’s largest plant and could be one of the most uncompetitive but the union has learned to work well with GM and has been rewarded with contracts for one of the best selling cars GM makes several times. In todays world everyone wants to make more money but Union or Not someone has to pay for the higher price in labor in prices. It is the great catch 22 that has been around for year. My comment like everyone wants to be a millionaire but they all want to shop at Walmart is an example of this paradox. There are many who want to make a lot of money but they do not want to pay the prices and go with the higher wages and go to Walmart love em or hate em to buy cheaper imported products. This is the majority too. Basically it is simple economics. Observer I did not place all GM global leadership in Germany just some of their products. The FWD based models may be done there but any Alpha will have input leadership more from Detroit and Australia. Even the smaller based platforms will be more based in Asia with input and contributions from NA and Europe. You either do not understand how this works or are letting your UK pride get in the way. Jointly these cars will better fit the markets and give us all things we lacked before in some good cars. Depending on the platform and what the car is will determine where it is directed from with input from most of GM’s Markets. Not just one will be responsible for a single vehicle outside of the Full size trucks and the Corvette. Even there we will see more global influence since they too will be sold globally. As for you’re anti labor comments? Sorry but I am not playing you’re political game as we have enough here. I only speak of how GM is going to go about building cars and the challenges. Yes labor plays a part of their decisions and that much must be considered. As for the political fall out of it that is for those in Europe to decide as I do not care what you choose. Sorry the Opel/Buick car building will be much the same as Chevy where they will work in all markets with input from around the world. Chevys will and for the most part no longer will just be Detroit based. Asia and Europe will play major rolls in what is done for each of the global models. Many of the Chevy platforms will also see work done in Germany. As for Opel, Buick and the So called Vauxhall brand they can and will be built where ever economically feasible and that is up to the unions and plants in Europe, NA and Asia. GM has more plants than needed and can farm the jobs around to who ever wants to be competitive. This is about making GM profitable in a struggling global market. Those who get it right live those who are too small or get it wrong may be sold to the Chinese or in the UK to Germany or India. You are right in one respect (as well as being wrong on others!) GM is a competative structure which is why the “So called Vauxhall brand” were able to negotiate new labour agreements in order to get the new Astra K to be built at Ellesmere Port (and as the lad plant) and the next gen Vivaro at Luton. However, politics still come into play – when the Zafira was moved to Russelsheim Opel privately admitted that economically it should have gone to Ellesmere Port but politically it had to stay in Germany. As for all the talk about Chevrolet in Europe its just not going to happen and I think the latest moves are the last roll of the dice for Chevrolet, if it doesn’t work I think GM will just pull Chevrolet out of Europe altogether. In the states plants are given a chance at a car or platform but GM has many plants that can do the job. The unions are offered the deal and will take it as they know the other plants can and will take their work. In Europe it is a whole different deal as like you said politics come into play and many other issues. This is why GM has been having issues in working new deals there. They even had a visit to Merkel to seek help in working with the unions there. Then you toss in the old Iron Curtin counties that are working hard to gain work and foreign companies to relocate there. They are kind of like the southern states here with tax breaks and non union plants that attract a lot of interest. The whole thing is complex and with the global platforms it is becoming easy to build anything where ever it has the lowest cost. The countries that get the unions to work with the MFG’s stand to benefit the most in Europe. Right now the unions in France have taken a turn for the worse and many companies are wanting out. Taxes and workers that do not want to put in the work that others at plants in other countries are will have put the hurt on anyone wanting to move production there. I see it here with Goodyear tire as they would like to stay but they have little reason to stay anymore with the way the workers at the plants behave and the issues with the government. Countries and workers need to learn to be competitive today as those who will work with a company will gain plants and income that will bring a larger tax base. If they try to take it off the top from the start few will take that deal. Here were I live the cycle has already happened where the unions ran much of the work out but now today after some hard lean years we are starting to see cooperation on both sides and work coming back. The new governor has done well to attract business and to help retain companies here. The state has more money coming in now too with the increase of business. There is for sure more work to do but for once someone in the rust belt has made gains vs. losses here. It is not a matter of right or wrong but working together. Also people have to understand we all are not going to be millionaires and still be able to shop at Walmart. You want the pay you are going to have to pay the prices it takes to make that kind of money. On a lighter note I think have uncovered Alex’s secret! When things go quiet on GM Authority he posts something about Vauxhall / Opel & Chevrolet just to start a big argument that keeps everybody busy! Alex are you going to deny it???? And now we see the beginning of a “One GM”, sans Caddy. Certainly Opel & Buick will share, the outcome will be much like Honda/Acura in that the divide between Buick and Chevy in NA and China will become narrow. The new Chevy Heart Beat Design and the evolution of Mark Adam’s German Precision theme share many of the same design attributes. This will make it far easier for GM to build value lineups appropriate for highly diverse regions. As an example, we will see Holden sell Cruze and Astra side by side; Chevy Brazil can drop Spin & one again source Zafira. I doubt this will harm Buick in the US provided the Buick varient come fully loaded with more compelling pipedream options. Encore and Trax will be the first real test considering the design similarities. Opel is my favorite division and I wish it had been totally paired with Chevy. Ford now sells mostly European designs in the USA & Chevy would benefit from cars like Corsa, Astra and Adam (as a Jute/Voltage fighter).